Hunting is different than you might perhaps imagine if you’ve never done it. There’s definitely an expected thrill when you find your target and take your shot, but that thrill is ephemeral (especially when, like me, you don’t have any desire to even kill the animal — I never have). The vast majority of the experience devolves into a game of patience. You prepare your arsenal slowly and methodically before you set out, find a likely spot to wait for your prey and then hope they walk across your crosshairs. The vast majority of your hunting experience is solitary, quiet and lonely, and for that I never enjoyed it. 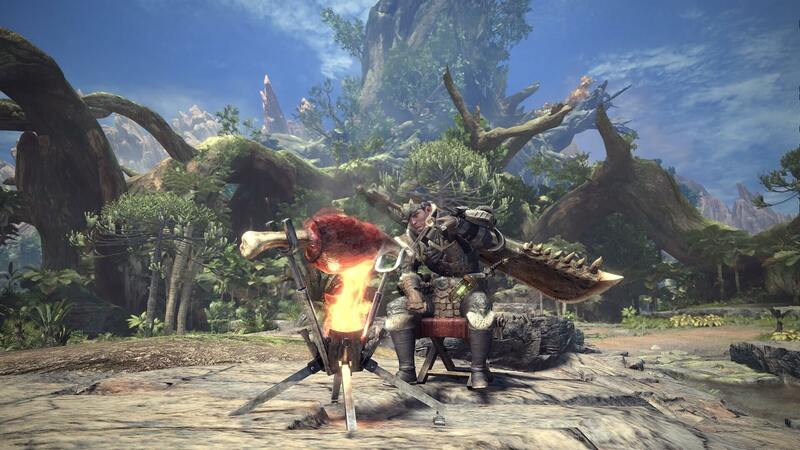 Monster Hunter: World isn’t really anything like that on its surface, but once you dig down into it, you’ll find that some of those life lessons learned from hunting are just as relevant out in the forest as they are in the game. It makes for an experience that’s somewhat unique in the gaming world to say the least. 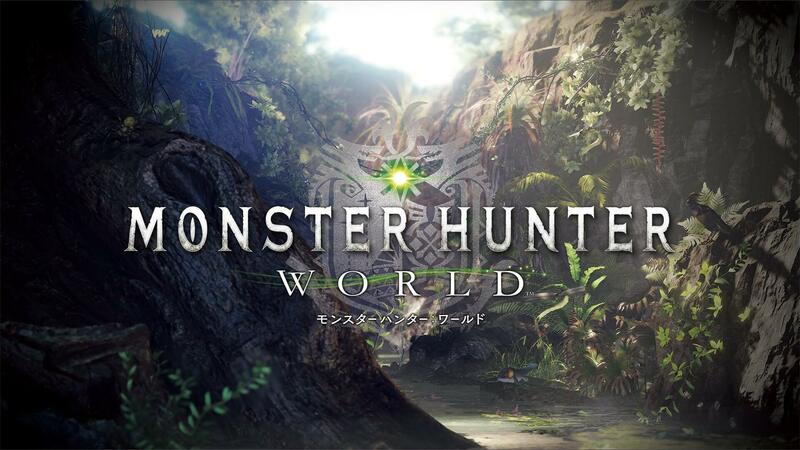 The core of the Monster Hunter series has always been the hunting experience and not just the fight. In World, you’ll start off any expedition by carefully planning your arsenal before the mission — a task with a surprising amount of depth. The game does not feature leveling or skills, but it does feature a robust crafting system that will allow you to use monster parts and other gathered items to create weapons and armor to fit your playstyle and situation. While later certain builds do begin to pull apart from the pack, for dozens of hours the weapons and armor you use will make a difference depending on your target. A monster focusing on ice damage might be weak to a fire or lightning weapon. You might not want to use a short sword and shield against a monster that flies, or you might need armor with a special skill. Of course, you’ll also need to consider style as part of your attire since the armor can look quite badass. Choosing your weapon makes the largest impact on your gameplay experience. With 14 to choose from, each with their own unique movesets, there are a lot of options to play the way you want to play. Each weapon has basic combos that display in real time in the corner of your screen, which makes it easy getting the basics down. Beyond the basics, there’s a ton of depth to each weapon. Dual blades are fast but weak against flying enemies, or a bowgun can attack from a distance but isn’t so mobile. Choosing the right weapon for the fight ahead is supremely important and the strong variation adds a lot of replay value. The only issue is that the depth is never explained in-game. Even core mechanics of weapons require research online to understand how they function. Once you get the learning down, the weapons are fantastic, but if you try to go into the game and learn as you go, you’ll likely come away disappointed with weapons you might have otherwise loved. Once you make it into one of the game’s five primary environments, each characterized by a colorful landscape and filled with monsters large and small, you’ll begin exploring for your target. That target can either be a quest or a target of your choosing, determined by crafting needs or whatever else you may hope to find. As you explore, green dust will flow out and highlight points of interest. These include herbs, rocks and, most importantly, signs of monster activity. 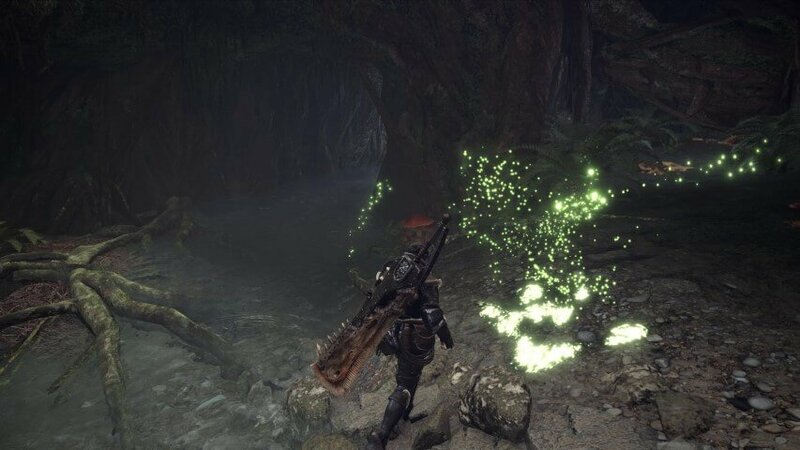 As you find more signs, from tracks to mucus to tree scrapings, you’ll level up your green dust and it will eventually begin to show you where your target is. It’s about as fun as it sounds (not very), but it does feel like hunting and the experience wouldn’t be nearly so memorable without it. Combat with the monsters is an epic affair. In a way, they’re a lot like standard hack and slash bosses. They’ll use a few choreographed moves, and are bullet sponges that can take upwards of 30 minutes to kill. The enemy attacks are generally easy to avoid, or very hard to avoid with little in between. The monsters have no health bar so you’re left to guess how much progress you’ve made with only an occasional limping gait to clue you in to the fact the battle is almost done. Periodically, the monster will run away faster than you can keep up and you’ll have to track down the beast a few times before finishing it off. These moments of flight offer the opportunity to remind you that this game is more than just fighting. You’ll take this time to craft more potions to heal yourself, eat some food for additional bonuses, and re-sharpen your blade to ensure it’s doing full damage. These tasks are very procedural yet are central to Monster Hunter’s identity. The game is not a boss rush and that’s primarily due to this downtime. If it’s an experience you’re enjoying there’s no problem, but those who want to stay in the action are likely to find the experience grating after the upteenth time sharpening a sword and then chasing a monster through a familiar environment. Ultimately, the combat is simple. You’ll use your chosen weapon’s typical attack pattern while dodging left or right at the appropriate time. You’ll probably only get a few hits at a time for minimal damage if you can’t hit the monster’s weak point. Even if you can hit the weak points and use an appropriate weapon, the fights will still be drawn out affairs even ignoring the downtime and chase. These monsters simply have a metric ton of health and require an equal ton of patience to push through and ultimately slay your target. The final moments offer an opportunity to break down the beast for random crafting parts. If you get what you were hoping for then you’re golden — if not, you can expect to be rolling out to participate in the exact same fight once again until you get that coveted drop. The game’s story provides context for all of this hunting. You’re a hunter sent as part of the Fifth Fleet to investigate a new land and research its inhabitants. It turns out that giant and powerful monsters are moving through the new continent as part of the Elder Crossing and it’s your job, ultimately, to figure out what’s going on. As you progress you’ll meet tons of cool characters and badass hunters who play a big part in the world, or at least the game’s framed as if they do. You’re pretty much the only one who ever kills anything and you’ll have forgotten about the new faces you met within a day since the story is simply nothing to write home about. As a solo experience, Monster Hunter is neither good nor bad — it’s just perfectly fine. The franchise makes up for it with multiplayer hunting and that’s where the real fun is found. Fighting a giant beast is cool, but doing it with three friends is much more fun. The addition of new players brings new strategies and allows players to breathe more and focus on rewarding combat instead of constantly dodging when you’re the monster’s only target. Even the exploration segments are better as four can find a monster faster than one. This game jumps from fine to borderline excellent when playing with others just as it was designed. So it’s surprising that this multiplayer-centric game constantly hamstrings itself with baffling design decisions that actively prevent you from playing with friends. If a mission will have a cutscene, and most new missions will, then you can’t group with anyone. This means if you’re progressing at the same time with a friend, you each need to play the new mission solo until you watch the cutscene and then one player needs to quit their mission and join the other’s. Even worse, you can potentially not get the rewards of the quest if you don’t join quick enough. No one could justify that design decision. Cutscenes are frequent and constantly needing to regroup is a drag. The problem dissipates when you get to the end game and are simply fighting monsters in the wild over and over, but that can take dozens of hours to reach. Grouping with random players is also full of bad design decisions. It’s still great to play with others so you’ll feel like you should request others join you, but you can be punished for it. Players only have three lives total before the mission fails. During an early fight with a fearsome dinosaur, I fought for 30 minutes and died twice along the way. The beast was limping badly and clearly weak when someone finally joined my game. He ran right in and promptly died, failing the mission and sending me back to base with nothing to show for my half hour. It was miserable and makes you question whether you’d even want to play with random players. With better online systems, this could have been a gem but the design simply hobbles the game. The achievements are going to be an incredible grind. You can play for countless hours and earn very little gamerscore. The story may not be complete for dozens of hours. 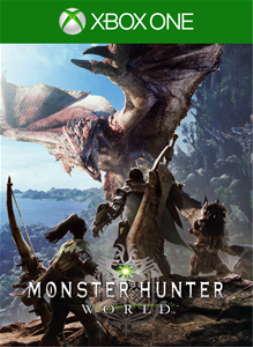 When it finally is, the grind has just begun, though, as you’ll need to kill the small and large versions of every single large monster. Whether a monster is large or small is random and not readily apparent when you first enter a zone, so you’ll spend your time hunting, and hunting, and hunting, hoping for a stroke of luck when you see a rare monster. Then you have to kill it. Estimates put that achievement alone at over 1000 hours depending on your luck. That tells you all you need to know about the achievements. This game was featured in our Best Xbox One RPGs Available in 2019 article. Why not check it out to see what else made the cut? The thrill of the hunt is alive and well in Monster Hunter: World. Whether it's a giant lizard or a flying dragon, the beasts you'll hunt will require careful planning, tracking and execution to down. This enjoyable gameplay loop is filled in with beautiful zones and a completely forgettable story. Character development is exciting as you piece together armor that will help you tackle a given foe and a huge bounty of weapons offers plenty of different playstyles, although learning those styles will likely require watching a outside tutorials to really excel. The game is wonderful with friends, but unfortunately the implementation of co-op only works well in the end game — story missions can often only be consumed solo, a huge misstep considering how much better the co-op can be. 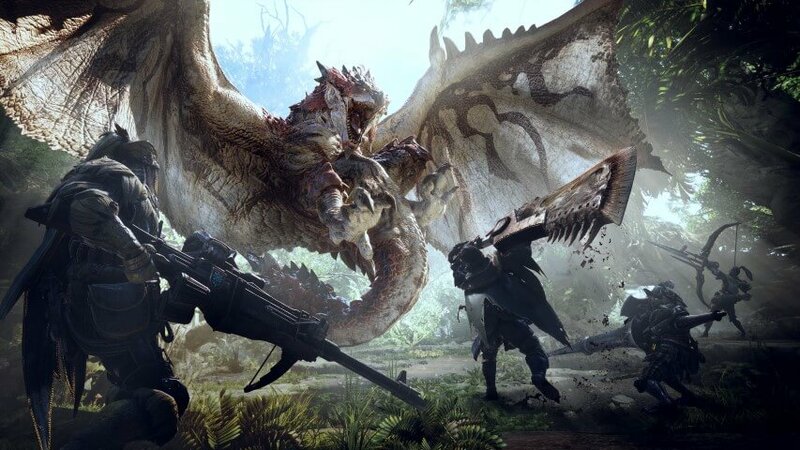 Monster Hunter: World captures that feel of hunting, and despite its technical quirks and poor design decisions, if you've got a group of friends to play with it comes highly recommended. If you're running solo, you might be better waiting for a sale. The reviewer spent 12 hours preparing for the hunt, eating really well and killing wild beasts. 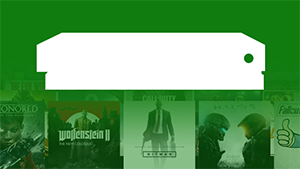 He collected 9 of 49 achievements for 105 Gamerscore. An Xbox One copy was provided by the publisher for the purposes of this review.